Love, Actually and Notting Hill are two of my favorite films; not only do I own the DVDs, I also have the soundtracks. 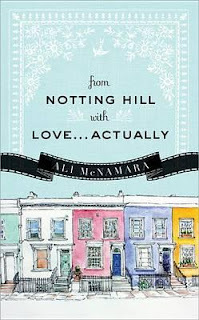 So imagine my excitement when I was asked if I would review Ali McNamara’s debut novel, From Notting Hill with Love...Actually. YES! YES! YES! Movie fanatic, Scarlett O’Brien dreams of her life one day being as glamorous and romantic as the movies she worships up on the big screen. Lucky for her, she finds herself housesitting smack in the middle of Notting Hill, one of London’s swankiest neighborhoods, the setting for many British films and the stage for her very own romantic comedy. For one month she leaves behind her dad, job and fiancé, David for the role of her life, but it doesn’t come without its complications. Immediately Scarlett makes a new circle of BFFs. Oscar, Ursula and Sean can’t help intrigued by this new girl from the country. But an ignored secret brings all of them together in the effort to piece together Scarlett’s past. A yearning for something that’s lost. Scarlett is a dreamer and a hopeless romantic. If you love romantic comedies, this is your book and Scarlett will be your new favorite character. 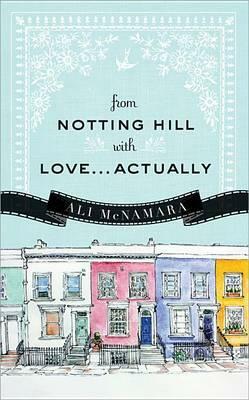 I had a feeling I was going to love From Notting Hill with Love...Actually, and I was correct. I read it in one sitting. FYI: It’s kind of long – we’re talking 425 pages. So put some time aside for this really enjoyable novel! At the end of the book, take Scarlett’s Mini Movie Quiz. I don’t want to brag, but I will. I got 10 out of 10 questions correct! Yay! On a side note, the Love, Actually soundtrack is fabulous for the upcoming winter holidays! Love your review! I have been wanting to read this book! Thanks!